What’s that in the distance hanging from a tree? 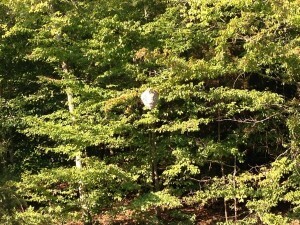 If you answered a hornet’s nest, you are correct! It’s the first one I’ve ever seen in person in the wild (with real, live hornets buzzing in and out). What does this have to do with root cause analysis? Practice the skills you learn in a TapRooT® class by analyzing everyday situations. In this example, let’s look at Energy – Safeguard – Target. I guess I would call it a biological source of Energy – HORNETS! Anything that disturbs the nest. It could have been me if I moved any closer. What are the SAFEGUARDS that protected me from the hornets? In this case, the only safeguard was my own awareness when walking through the woods. That’s a pretty weak human performance safeguard. But this time it worked! Should I have removed the hazard? No way! That’s much more risk that just leaving the area and remembering where the nest is. How many “awareness” safeguards do you depend on at work? Is that really good enough? Should you be removing the hazards? That’s your root cause analysis tip to think about for today!